It doesn’t happen often, but every so often Grant isn’t home for dinner …. and he doesn’t like salmon, so that is the first thing I think of making. Loved this spicy, tasty salmon with a bit of sauce to drizzle over rice or vegetables. Not only was this tasty, spicy, and packed with flavour, it was super easy and didn’t require any cleanup! How fantastic is that? To make the sauce, whisk together chili sauce, soy sauce, garlic, fish sauce, ginger, lime juice and Sriracha in a small bowl; set aside. Place salmon onto prepared baking sheet and fold up all 4 sides of the foil. Spoon the chili sauce mixture over the salmon. Fold the sides of the foil over the salmon, covering completely and sealing the packet closed. Just a few items needed, wrap this little salmon up in flavour and bake! Preheat your oven to 375 and prep the salmon. 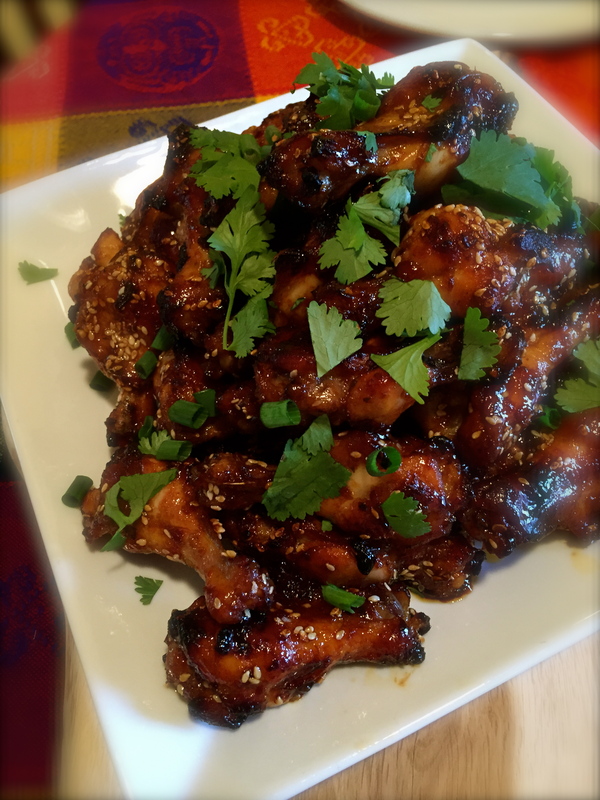 Pull it out of the oven and sprinkle with cilantro, green onions, peanuts and sesame seeds. Enjoy! Flavourful Thai curry with plenty of vegetables and just a few slices of duck breast – serve with a handful of noodles. We just got home from three weeks in Mexico, and that always makes me turn to Asian dishes in the kitchen. Well, that and the old comfort foods like roasted chicken and mashed potatoes, which are always a family favourite. Thai curries come together very quickly, and are very easy if you take a few moments to get everything ready first. This is one of those recipes that works more like a guideline – we made this for dinner for two, but double it up for a group. Cook noodles according to the package directions and set aside. Duck breast is really easy to cook, and not something to be intimidated by. I don’t know why I didn’t take a moment for a photo doing this …. maybe next time. Score the fat on top of the desk breast lightly, not through to the meat. Set in a cast iron skillet (or non stick if you don’t have cast iron) and gently heat on med/low so the duck fat can release and the top gets nice and crispy. Every stove top is different, so just watch yours. When it has reached that golden layer of crispy goodness, flip it over and cook until preferred doneness. 170 degrees is the golden rule, but if you prefer medium rare, go a little less. Whatever temperature you desire, make sure to remove it from the heat and allow it to sit and rest – distributing the juices evenly. While the duck is cooking – slice and set aside the vegetables you have chosen. The only thing that is important is that you separate the vegetables based on how long they take to cook. Heat a saucepan, add some peanut oil (or any neutral oil with a high smoke point). Stir until the curry is fragrant – just for a minute or two. Add 1 can of coconut milk and 1 cup of stock (chicken or vegetable). Add the vegetables, and as soon as they are lightly cooked, but still crisp remove the curry from the heat and stir in the holy trinity of Thai curries …. Without the duck breast you’ve got a perfect vegetarian dinner. Thai grilled chicken should be moist, flavourful, and make you want more …. this is it. This chicken. So moist and delicious. The dipping sauce takes it over the top! Use whatever chicken you have, or prefer, this amount of marinade worked with 2 boneless chicken breasts, cut into pieces and pounded equal thickness. I reserved some of the marinade and kept it to serve as a dipping sauce, it was incredible. Serve the chicken with the reserved marinade. put all the marinade ingredients into the bowl of a food processor, and give it a good whiz …. Grill chicken until just cooked through, and serve with dipping sauce. Grill just until cooked through, these juicy pork chops hit all those notes of spicy, sweet and sticky – get out the napkins! To make the pork chops, combine the soy sauce, honey, ginger, garlic, curry paste chilli & lime juice in a bowl and mix well. Taste, and adjust if necessary – especially for heat. If you like it hotter, add more! Place the pork chops in a ziploc bag and pour over the sauce. Close the bag and allow to marinade for 20 minutes or up to 2 hours. Grill over high heat until just cooked through. We served these with a crunchy Thai noodle salad.